I recently saw a top like this in a shop and decided to make one for myself (for much less!). 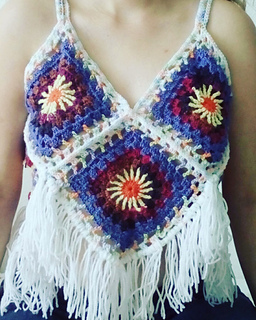 All in all it’s 8 granny squares sewn together to make a trendy crop top. This pattern requires a skein of orange, yellow and white yarn, and 4 more skeins of other colors. Can be made in almost any size by using a different hook for a different gauge.